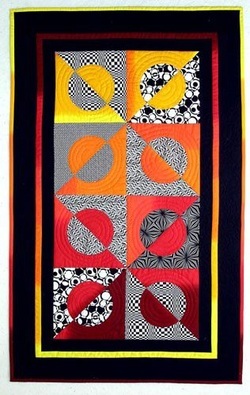 Christine Porter came from UK to run two separate one-day workshops for us in September 2013.
produce stunning designs which look complex but are so simple to piece! fabrics introduce shading which enhances the effect of the principal fabrics. 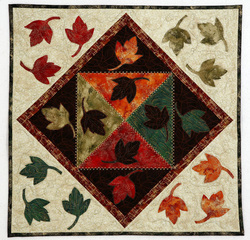 On 25th we made four blocks on point in autumnal colors, scattered with leaves using both the reverse appliqué and machine appliqué stitching. We had the opportunity to do some pretty embellishment and started to create a Fall Foliage souvenir to hang on the wall or make into a pillow.